Yes, spring! 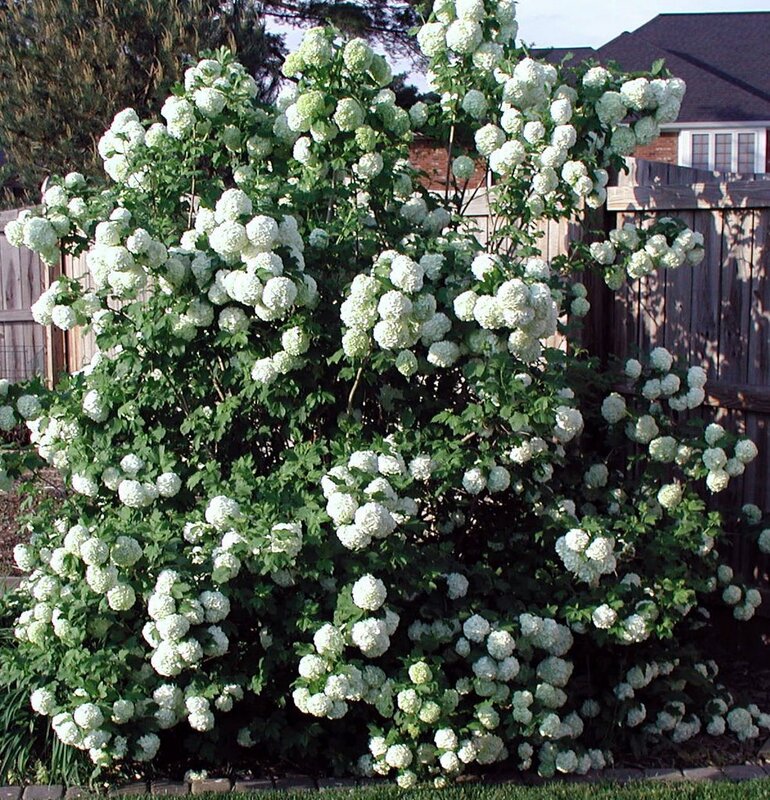 This is an old-fashioned 'snowball bush' in bloom a few days ago. I planted this just because I thought it would be a nice, old-fashioned large shrub to fill a spot in the back yard. My 'city grandma' had one, and I presume that my 'country grandma' probably had one, too. I got the last of the weeding under control this weekend, and so I am ready to head out on Monday to start buying plants for containers and various flower beds. I hope all the greenhouses and nurseries are getting re-stocked after the weekend, 'cause here I come. I did make one brief trip to a greenhouse on Saturday to help one of my sisters buy plants for her containers. That's all she plants, 10 containers or so. Or should I say that I plant them and then she waters them all summer. She did not inherit any gardening genes. I thought it was interesting that she bought some snapdragons because they remind her of our Dad. I buy double impatiens because they remind me of him. I wonder what other flowers my other siblings recall from his gardens? My youngest sister, who does have the gardening gene, though she realized it later in life (making her a late-bloomer), called this afternoon to tell me that someone at a greenhouse she went to said that because we had thunderstorms in January, we would have a late frost in May. I sure hope that isn't true! I plan to start planting by mid-week! 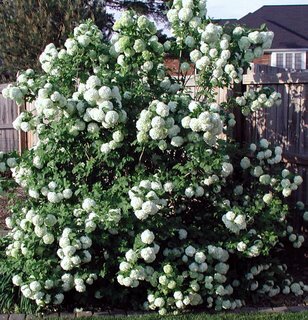 Yes, your 'country grandmother' had a snowball bush too. It was large and just south of the back porch. Sweet Williams always grew under it. On Mother's Day we would all wear a red rose to church to indicate our mother was living. Grandpa (John Edward) would wear a white bloom from the snowball bush, this indicated his mother was not alive. I always felt sorry for him that he no longer had a mother.